Nothing to do with Brexit....High street retailers are not competative compared to online warehouse companies. Thats a western world problem....Jack sh*t to do with Brexit....Bit sad you even thought it might be.. Bit sad our prosperity is being threatened for very little in return. Look you know the snow is the fault of Brexit and Trump.. The notion that Maplins, and Toys are Us have not been on the decline for the last decade, that they where actually really really buoyant and doing really really well even though they can't compete with the likes of Amazon, nope, it is all has to be the fault of Brexit and Trump.. The British economy is showing signs of deteriorating just as the government attempts to reassert its vision for Brexit, according to a Guardian analysis of economic news over the past month that highlights the country’s increasingly fragile position on the world stage. Cracks are beginning to appear in the picture of economic resilience built up during the final months of 2017, when a sustained upswing in global growth helped to lift economic output in Britain. Fresh figures this week also showed the economy grew more slowly than first thought in the final three months of 2017, with GDP growth having been revised down to 0.4% from 0.5% – putting the UK at the bottom of the G7 league table. The latest dashboard shows British households coming under significant pressure, as inflation stuck at its highest level for almost six years last month despite expectations for a fall. Stoked by the pound’s weakness since the EU referendum, the rate of growth in prices has been stubbornly high for several months now - although wages are at last beginning to rise. Jacob Rees-Mogg (raised in a country house, Eton, Oxford, then an investment banker, net worth >£100m) on @Channel4News just now calling John Major (raised on a council estate, left school at 16 with three O Levels) the "European elite". Barnier adviser De Rynck There is no appetite in EU to extend 2 year deadline for Brexit talks adds UK cannot unilaterally withdraw its decision to leave. I think this is called downsizing. Anglo-Dutch consumer goods giant Unilever, maker of Marmite and Dove soap, is to abandon its London HQ. Spiegel reports Up to 20 banks will open Brexit offices in Germany creating up to 5-6,000 new jobs. 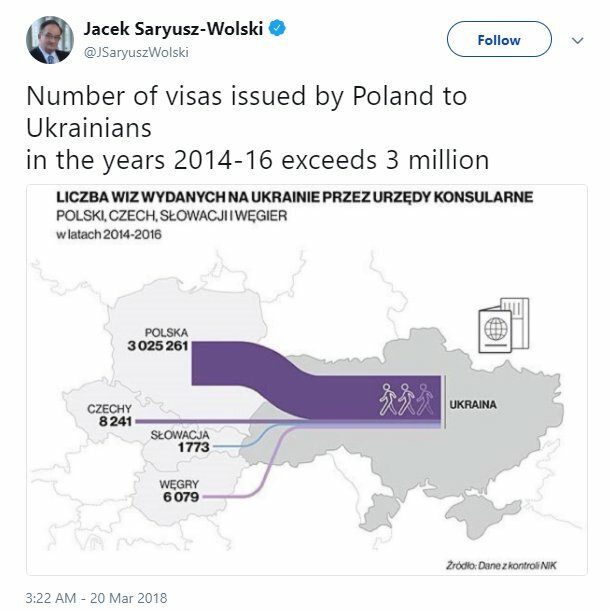 3 million Ukrainians have worked in Poland in the past years. When did we become so pathetic. More voters in Britain rate leaving the EU as a priority ahead of maintaining the Union with Northern Ireland, a poll has suggested. Emergency debate tomorrow in parliament granted re Vote Leave. Fresh evidence has emerged tonight re AIQ & Cambridge Analytica. Quote: Apparently the Europeans haven't had enough muslim immigrants! I hope Britain does get the hell out. I would want to leave too! I hope Poland leaves next. This is absurd. Maybe it will start a domino effect. Poland wont leave. They love the money. The Catholic establishment and US cons love them inside. And 70-80 of them support EU. Lawyers for Brexit campaign whistleblowers say we think there is a realistic prospect of conviction for the Vote Leave offences. Important new polling data by @PeterKellner1 shows 1 million people have changed their minds about #Brexit - and would now vote to Remain. Yay! 28 Days Later. Thanks old fogies. NB: Poll results are for whole of EU.